Harry Edward Ryall was born in 1894 in Langley Mill, Derbyshire2. He was one of the three sons3 of William & Minnie Ryall of 11 Collington Street, Beeston, Notts. As a boy, like his brothers, he attended the Church Street Council School. At the age of fifteen he enrolled in the newly formed Boys Brigade which commenced in 1909. At the age of seventeen he transferred to the Beeston Old Boys Association and was still a member there when hostilities commenced. Harry Ryall was probably the first to enlist from the "Old Boys", joining the Royal Medical Corps before joining the Grenadier Guards as part of the British Expeditionary Force. After being promoted to the rank of Corporal he was recommended for the Military Medal by the Major General of the Guards Division, for setting a fine example to his comrades for bravery and coolness under fire in the actions at the "Battle of Loos" in October 1915, especially in connection with the taking of the Hohenzollen Redoubt. 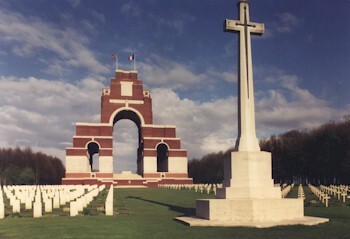 Corporal Harry Ryall was involved in many further actions, but was reported missing on Monday, 25th September 1916, yet another of the 73,000 whose bodies were never identified and he his commemorated on the Thiepval Memorial. Three months after Harry's death, his father was officially presented with the Silver Medal by General Maxwell, Commander of the Northern Military Division. The Military Medal was instituted in March 1916 as an award for non-officer rank of the army for acts of bravery. On the side of the Military Medal is inscribed "For Bravery in the Field". The Corporal's name is engraved around the edge of the medal. 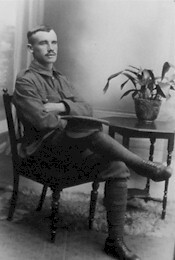 Two other sons of William & Minnie Ryall served in the army, Ernest Allen the youngest served with the Territorials. William, the eldest, lived in Arnold, Notts. He was a married man and the couple had three young children. He was killed in action on 19th June 1917. 3They also had a daughter, Alma M, b. Heanor, Derbyshire, in about 1896.